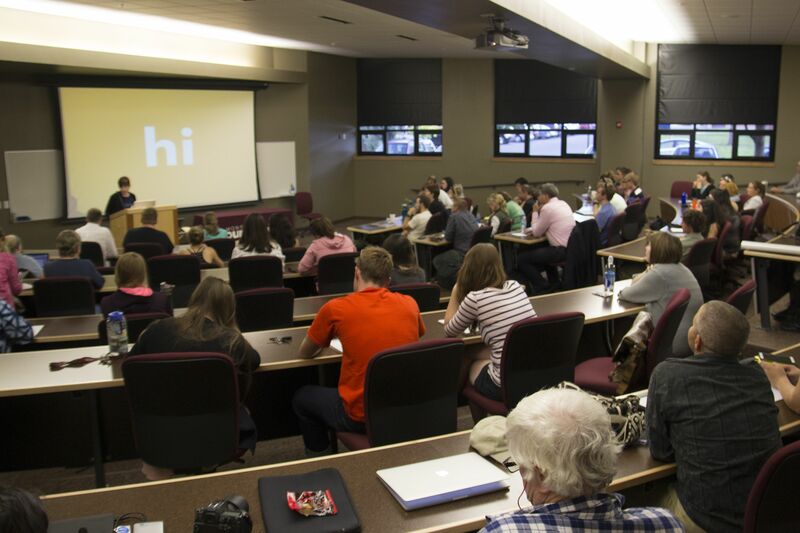 University of Montana School of Journalism students heard advice from different generations of alums during homecoming. 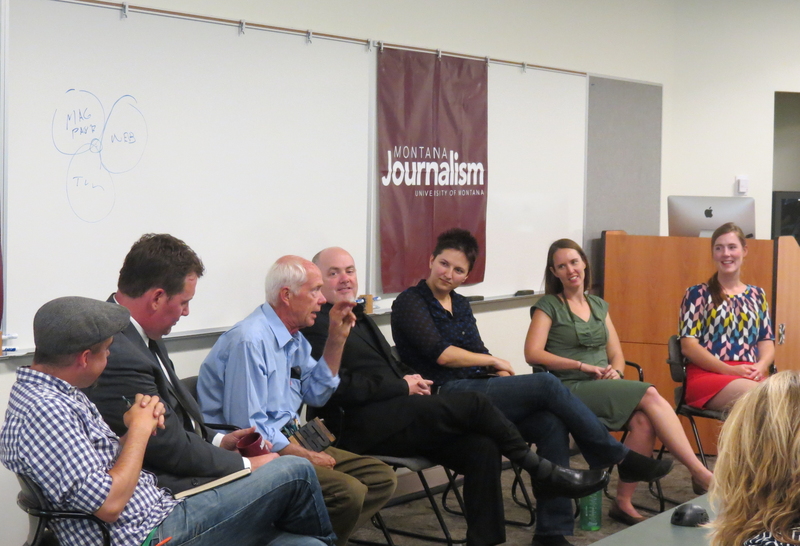 The J-School hosted an alumni roundtable discussion to kick of the homecoming celebration. The roundtable featured a panel of J-School graduates currently working in journalism-related fields. Panelists are listed below. The panelists shared their experience with students, professors and other J-School alumni. Kevin Van Valkenburg advised students to reach out and grab their dream jobs. “Employers are not going to make that leap for you.” He said it was important for students to market themselves and share their work if they want to get the job. 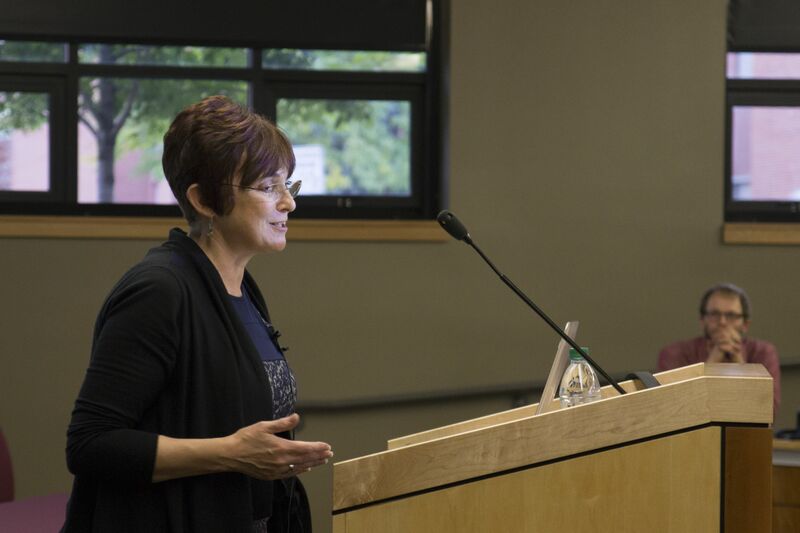 Holly Michels added students need to be prepared for what they are actually going to be covering once they’ve graduated. She said students need to understand they’re not going to be doing long, in-depth reporting right out of the gate. “They might write something about a giant pumpkin,” she said. Lido Vizzutti and Kristine Paulsen chimed in, adding it’s difficult to get recognized, but social media is a good marketing platform. Both Vizzutti and Paulsen do freelance work; a field where, they agreed, self-promotion is important. The panelists took questions from the audience and many people were interested to see how social media has changed the journalism industry. Nils Rosdahl said he retired from teaching just as social media was beginning to make an impact, but noticed the basic principles of journalism still apply. He said even with sites like Facebook and Twitter, there is still a need for people who know how to collect reliable information, write copy and edit copy before a post goes live. UM J-School Dean Larry Abramson said students should apply their journalism ethics to their social media presence. Social media can be a great way to find sources, according to Van Valkenburg. Michels agreed. She said social media brings potential interviewees to the surface. She wrote about an accident in her community and when she needed to contact the victim’s family, they were posting on Facebook on the link to the article. Their posts made it easier for her to contact them and write a more in-depth story. Abramson asked the panel about another side of the news industry where the effects of social media are not as prevalent; management. Van Valkenburg said one thing that can make or break a news organization is its manager or editor. Tom Ciprari said no one wants to go into management, but for him, it was an obvious progression after being in the field. “How long can you be that person who grabs their camera and runs to the scene?” he asked. Ciprari said the industry is constantly changing, and eventually, he felt it was his responsibility to take on a position where he could pass down what he’d learned to other reporters. “As you progress, you will become responsible for those coming next,” he said. Becoming station manager felt like a natural step. This way, he said he can show the next wave of journalists what to do and what not to do. “It’s just another form of teaching,” he said. Old friends and colleagues reunite at the J-School Homecoming Reception. 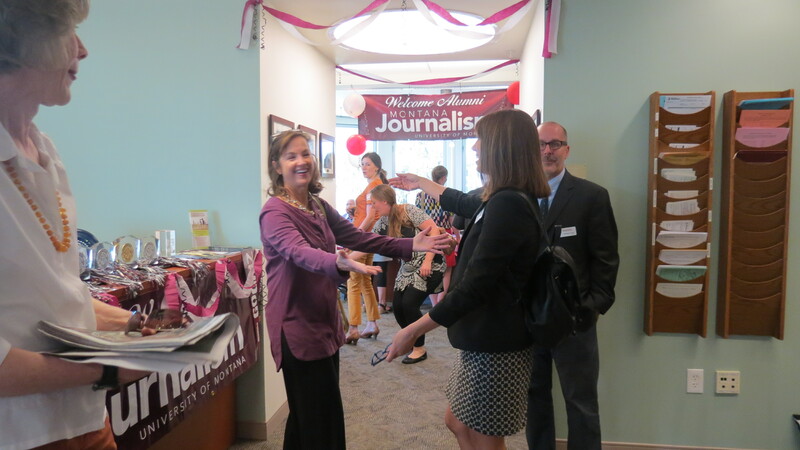 After the roundtable, alumni, students, and J-School supporters gathered for a reception in the A.B. Guthrie Library to exchange experiences and catch up with professors and colleagues. To see more pictures from the event, visit our Facebook page and view the Homecoming 2015 album. The year is off to a fantastic start here at the UM J-School. The smoke from the summer fires has cleared, and we’re enjoying blue skies and cool fall weather. Our students and faculty are hard at work already. Our student produced show, “Business: Made in Montana,” will air Oct. 22 at 7:30 p.m. on MontanaPBS. The Kaimin, our school newspaper, is moving more content online, while the printed edition has become a full-color weekly publication. The Montana Journalism Review is off to a strong start with a new staff, and a wealth of new stories to produce. This year’s Pollner professor is Kevin Van Valkenburg. He is a distinguished reporter and known for his work with the Baltimore Sun, ESPN.com and ESPN the Magazine. He will present a talk titled “The Art of Storytelling Will Always Be What Matters, Not the Medium.” The annual lecture will take place Oct. 19th at 7:00 p.m. and, as always, the event is free and open to the public. As we move forward into the new school year, we invite you to celebrate with us. The festivities begin this homecoming weekend. 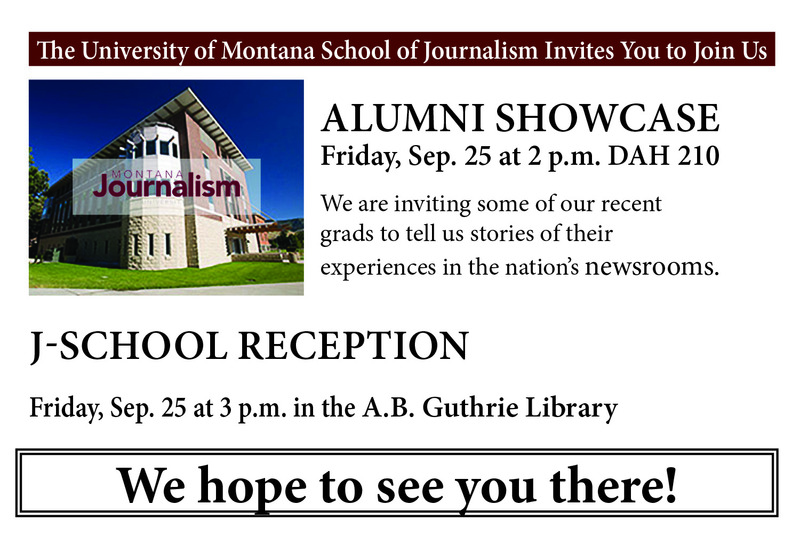 Join us for our alumni showcase and J-School reception. The showcase is Friday, September 25 at 2 p.m. in Don Anderson Hall, room 210. As usual, we are inviting some of our recent grads to tell us stories of their experiences in the nation’s newsrooms. This is a great chance to see how our students are adapting to the changes in our ever-evolving industry. As we move into the digital age, our students must learn new skills and we must modify our idea of traditional media. We teach our students to maintain the same level of integrity and ethical conduct as we have taught our alums for the past 100 years. We hope to see you after the showcase. Join us for a reception in the A.B. Guthrie Library (3 – 4 p.m.). We look forward to sharing a libation, catching up on your news, and talking football.